Cagayan de Oro City (11 November) -- Being the first accredited Consumer Organization in the province of Bukidnon, the Market Vendors Association of Valencia, Inc. (MVAVI) had the privilege of joining the DTI Bukidnon Enforcement Team in monitoring the implementation of Fair Trade Laws (FTL) in the City of Valencia. This is the first time that an outside observer was able to join the team in their special monitoring of products. 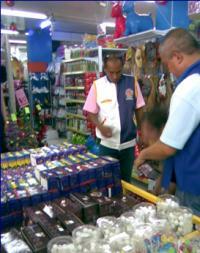 During the enforcement, they were able to visit 19 business establishments, one of which was found violating the Standards Law for selling miniature Christmas lights without the Philippine Standard (PS) or Import Commodity Clearance (ICC) mark as mandated by law. These items were now removed from the shelves to keep the public from buying the substandard product. MVAVI was organized way back in 1987, but it was only last year that it gained accreditation with DTI as the province's first Consumer Organization (CO). As accredited CO it was tasked to advocate consumer rights and responsibilities, actively work with implementing agencies and businesses in undertaking consumer welfare protection programs, and monitor the implementation of Product Quality Standards and Fair Trade Laws among others. To date, MVAVI was able to conduct the following activities: Consumer Education Briefings, Business Name Campaign, Inspection of Weighing Scales in the City of Valencia Public Market, and initiated the Tree Planting activity during the Consumer Welfare Month in response to the call for greening our environment.